The unit has 6 individually monitored high-voltage sockets. Any overload is indicated by means of a warning lamp and a signal at the signalling socket. 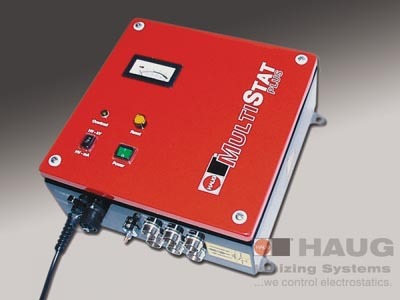 All HAUG ionizing units can be connected using the X-2000 high-voltage connector system. The most appropriate HAUG ionizing units can therefore be used depending on the fitting dimensions, the required output and the application conditions. The display indicates the high-voltage or currents at the 6 high-voltage connections. The currents are output one after another in a fixed sequence. This allows good monitoring of the ionizing units connected to the HV sockets.